And death shall be no more; death, thou shalt die." And the sound of a voice that is still!" A rainbow in the sky." 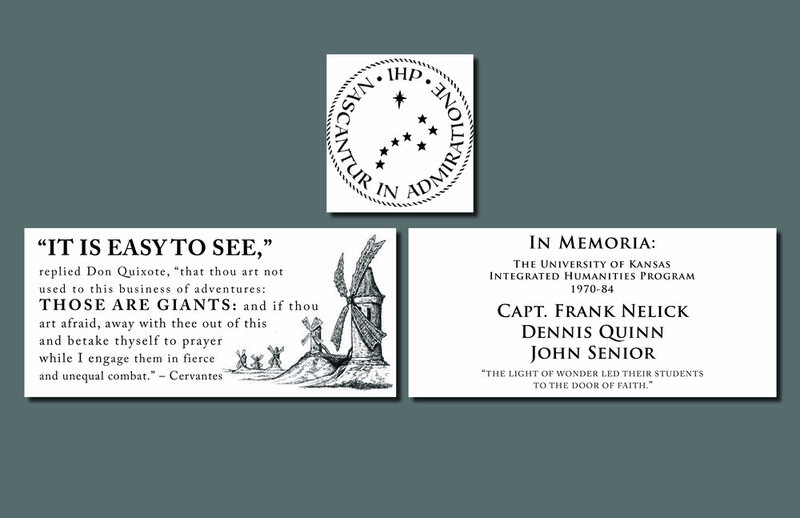 Last April, we invited you to join us in raising a memorial to the Integrated Humanities Program and Professors John Senior, Dennis Quinn, and Frank Nelick. Your response to our invitation raised $40,460 by the end of September. Warm thanks to you generous donors! When the memorial is dedicated, we want you to join us to celebrate! Look for news on the upcoming Memorial Dedication Ceremony. A group of friends - students of the Humanities Program - have found a home for a memorial to the Program and the Professors: Nelick, Quinn, and Senior. After the University of Kansas declined, the parish council of the St. Lawrence Center graciously agreed to allow a memorial to be placed there. The memorial will be built in an area accessible to a public sidewalk from Daisy Hill to the main K.U. campus - very convenient for students and visitors. in recognition of their program’s tie to the Humanities Program and out of gratitude to the people of the St. Lawrence Center parish for allowing us to install the memorial on their grounds. © 2018 IHP Memorial Fund, Inc. The content of this website may not be copied or disseminated without written permission. The IHP Memorial Fund, Inc. is registered with the IRS as a nonprofit 501(c)(3) organization. Contributions are fully tax deductible as allowed by law.